A common denominator when it comes to YOUR Boise Hawks is the fact that their father’s were the one’s to get them started in baseball. From playing tee ball to acting as the bat boy for a major league team, these boys started out with their father’s by their side. 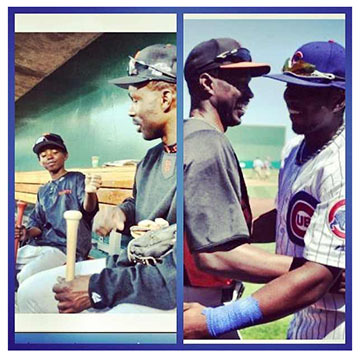 For Shawon Dunston Jr., baseball and life are one in the same between him and his father. Shawon Jr. started out with YOUR Boise Hawks last season but was sent back down to Mesa. Throughout the off season Twitter and Instagram posts told the story of his fight to get mentally prepared and come back strong for 2013. “While my father helped me mentally, physically I took it upon myself to work harder, put on weight, and to be prepared and ready once spring came.” While the season is just two games in, Shawon Jr. is batting .500 and proving himself on the field already. Shawon Jr. says that his father has always told him he did not have to play baseball, but, “if you want to do what I did for a living, there’s going to be sacrifices you have to make.” Missing out on special days such as Father’s Day is definitely one of those sacrifices. One of his father’s favorite sayings is “you’ll have me now, but love me later.” I think that says it all.